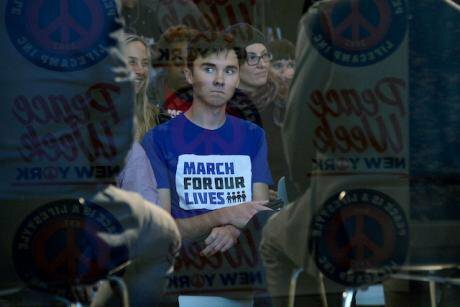 Anti-gun activist and school shooting survivor David Hogg, attends the 9th Annual Peace Week Town Hall in New York, NY, January 21, 2019. Anthony Behar/press Association. All rights reserved. Recently, many of the advocates of the People’s Vote stemming from the centrist factions of British politics have again started falling back on demographic arguments in favour of a second referendum. The theory goes something like this: Brexit voters were primarily older, whereas the young voted overwhelmingly for Remain – so now, as the elderly have died in their droves and young people have turned 18 and can therefore vote (and will vote remain) – the Brexit majority has been swept away in the sands of time. This point of view crystallised in the website Deatherendum, now shut down having caused outrage, which counted Brexiteer deaths to show how the majority was evaporating. This argument has been variously made by centrists since the referendum, like David Aaronovitch, who used the Viewsnight section of Newsnight to make the point, with Bob Dylan lyrics. Pollster turned journalist Peter Kellner called January 19 “crossover day “ – the day on which, if one assumed that minds weren’t rapidly switching from Remain to Leave and that turnout didn’t massively increase, the demographics would have switched to a Remain majority. Now, perhaps this is true. If anything, the last couple of years have taught us it’s that polls aren’t a particularly reliable source of information. But let’s say it is. Even in this case, it’s not a good argument. Pushing for a vote on this basis then crossing remainer fingers and hoping to be correct is a terrible strategy. Wouldn’t it be much better to try and win people around to your point of view, rather than making it look like you’re rubbing your hands gleefully at the thought of their grandma kicking it. Some of the outrage around the Deatherendum site was probably confected, but the reaction makes one thing clear. People find arguments premised on the mass demise of the elderly cynical and unwholesome. Making these kinds of arguments feeds into the arrogant remainer stereotype. Brexit was a vote against the status quo and nothing says ‘status quo’ like lawyers, pollsters and journalists desperately hoping that we just edge the majority in the other direction so that politics can return to business as usual. It stems from a liberal conception of politics in which there is a natural status quo which needs to be managed, where change is never to be won by organising in any way. It is this “the campaign doesn’t matter “ mindset which saw so many journalists shocked by the fact that the Labour party weren’t annihilated as predicted in the 2017 election. This kind of demographic determinism is something that has plagued parts of the left for years while they were on the fringes of politics. Faith would always be placed in the next generation while the status quo maintained itself and the revolution was consistently postponed. Increasingly centrist liberals who are so dominant in the debate have consigned themselves to this thinking while the left, previously derided as idealistic are the ones doing the necessary analysis of electoral politics and the use of state power. We are seeing this in the US, as the greying Democrats look proudly on at David Hogg and other young teenagers campaigning for gun control. What Hogg et al are doing is really commendable. We should all hope they succeed. But the people wistfully pondering what the next generation are doing don’t seem to realise that people once said the same things about them. This same logic applies to the demography-obsessed hard remainers. We need to change minds with a positive message like DIEM25’s proposal of a European Green New Deal. Hanging the country’s future on the right number of natural deaths and a contentious vote is only going to polarise this divided country further. Remainers beware, use demographic arguments at all of our peril.